FYI: Snowmobiling is, during the day, a safe and sane way to get from point A to B while taking in some incredible views. At night, however—night in Montana, nonetheless, with its big sky gone dark and not even a scrap of moon to illuminate the snow-covered trails—snowmobiling seemed like pure insanity. 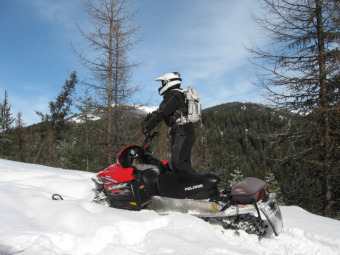 For me, it was beyond “extreme,” which was the only paragraph on www.eHow.com snowmobiling ,that I had neglected to read, before leaving on my five-day Glacier Country snowmobiling press trip. I had joined this cadre of journalists (two outdoorsy male writers and a woman from Connecticut who wore full-dress make-up at all times) two days into the trip, because I had been enjoying some special Girlfriend Getaway add-ons, so this was only my second time snowmobiling, and never at night. We were just finishing up our 32. oz. T-bone steak dinners at Trixi’s, which overlooks the breathtaking rugged peaks and towering forests of the Bob Marshall and Scapegoat Wildernesses. Trixi, the bar’s namesake, had been one tough little cookie – a former trick rider, roper and showgirl who bought the bar in the 1950’s (the jury is still out as to whether she was also a Madam or just really, really popular with men.) The place oozed Wild West atmosphere, down to the locals shooting pool while deep in discussion about the best way to smoke jerky—I overheard an interesting new recipe from one of the manly-men which consisted of soaking the venison in rhubarb wine and Cajun spices before smoking it. Tempted by the description, I went over and struck up a conversation and next thing I knew the man had offered to head back home and bring me back a sample. (Needless to say, Montanans are really nice.) Sure, I thought, anything to delay the moonlight return trip (wait, what moonlight? It was blacker than a biker’s jacket out there!) Five minutes later, gnawing on that tasty jerky, I took a last gulp of wine and attempted to man-up for the ride back. I asked Curtis, our snowmobiling guide, owner of Kurt’s Polaris , where we had rented our snowmobiles earlier that day, how long the ride back would take. He told me that it was only about 35 miles and that it “shouldn’t take long unless we have to keep stopping for what’s-her-name…” glancing over at Miss P.
We fastened our helmets and goggles and took off. For the next twenty minutes, we crept along the main road at about 10 mph before coming to the mountain path. I knew if we continued at this snail’s pace, I was going to freeze to death, plus it was boring. We decided to split into two groups, with Miss Priss-the-tortoise (now with her own private slow-poke guide) in one and the thrill-seeking-hares in another, saying we’d meet up again in about 10 miles. What transpired next was one of the most hands-down exhilarating nights of my life: Curtis started racing over the hills going about a million miles an hour (granted, it was probably only about 45 mph, but on the dark winding roads, with the wind whipping through, and the slip-sliding crunch of the ice, it felt “yee-haw” lightning fast.) It was like a big snowball combination of flying, skiing, zip lining and driving a formula car. I could barely see thru my fogged mask, but I knew I had to stick with Curtis, “my higher power”, like the glue that holds on the Kardashians’ false eyelashes. So I slammed on the gas and went for it. The speed was intoxicating, until Curtis felt guilt pangs and decided to stop and wait for the tortoises, who were miles behind us. I took off with fellow daredevil, Larry Turner, an amazing photographer from Oregon, and we raced down the mountainside like Batman and Robin, at an even faster clip, flying over the gnarly trails, singing Paul Simon’s “Slip Sliding Away” at the top of our lungs. Once when we stopped to catch our breath, we turned off our engines to see if we could even hear the others—nothing answered but a muted deep silence and then some low pitched hoots, which my outdoorsy companion informed me were probably some great horned owls… waaay cool serenade. About two hours later we arrived safely at the rental shop without a scratch on us. We were all jubilant with excitement, gleefully hugging and high-fiving, feeling so alive. Yeah, it was a little scary (o.k. maybe a lot scary) but isn’t pushing the envelope, doing something risky and exciting, one of the main reasons to travel? Not for Miss P., though. She crept in much later, fighting mad at “how selfish we were not to have waited for her, blah blah blah.” But even her whining couldn’t put a damper on my unforgettable ride through the beautiful, wonderful, thrill-filled wilds of Montana. Please continue reading my blog for Part two.